A Celebration of World Suicide prevention Day. 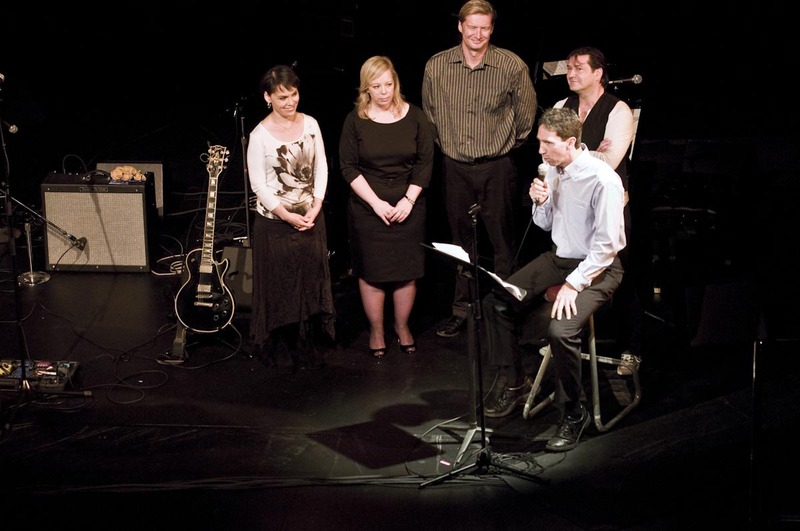 The event was the first of its kind in Canada. The purpose: to create a suicide safer community and to open up a dialogue about suicide. Not talking about suicide isn’t working. We’ve all been touched by suicide either directly or indirectly in our lives. Most recently, fourteen-year-old Jayme Rodemeyer died by suicide after being bullied for being gay. Even people, like Cher, who didn’t know Jayme felt profoundly saddened by his death. Cher said she cried, and wondered about “what this poor, defenceless child must have had to suffer through.” She and millions of people across the globe wondered how Jayme’s death could’ve been prevented. Scott Chisholm, the founder of Collateral Damage, believes that suicide is preventable. He is on a mission of change. Chisholm wants to get people talking about suicide, and connecting with each other to not feel so alone in the world. It is September 10, 2011: World Suicide Prevention Day. There’s a large crowd at Ottawa’s CentrePointe Theatre who’ve gathered for a fundraiser for Collateral Damage. Feelings of compassion, intimacy, and anticipation fill the theatre. Scott Chisholm appears on stage. He opens up the evening by comfortably chatting briefly with the audience, and then going straight to a video. The video is of Chisholm talking about his own experiences as a survivor of suicide. The video is compelling. Chisholm was only seventeen-years-old when his father took his own life. It was an incredibly painful experience for him. He felt very much alone in the aftermath of his father’s death, especially because suicide was something that was just not discussed. Suicide carried, and still does, a social stigma which causes survivors and those contemplating suicide to shut down. Shutting down and not talking about suicide make the feelings all the more intense and painful. However, by the simple act of talking, really talking, and opening up with compassionate hearts; Scott feels we can change that dynamic. We do not have to feel alone as survivors of suicide. And, suicide is preventable. Chisholm is now 47-years-old, married with children, and is a firefighter in Thunder Bay. However, twenty-nine years later he is still haunted by his father’s death and is highly sensitive to the pain other suicide survivors feel. This is evident in his video and in his dialogue with the audience. Chisholm has a special gift of not only reaching out to people, but also of touching their hearts. He introduces several people who are working with him on the Collateral Damage (which means unintended harm) project. One of those is Olympic gold medal champion swimmer Alex Baumann. Baumann was sixteen-years-old when he lost his beloved older brother, Roman, to suicide. Roman’s suicide ripped Baumann’s family apart. Like most suicide survivors, Baumann is still recovering decades later as are the other members of his family. Looking at Baumann on the stage, you can feel his pain. Just as Chisholm is about to introduce the Irish rock band, Friends of Emmet, my neighbour who is sitting next to me whispers: “You know, I’m a recovering alcoholic.” This is something that I did not know, but realize that A. wants me to know. I’d been living next door to her for six months, and had no idea. We’d just had the typical “hi, how are you” type of superficial conversations. This evening has already changed our relationship from one of acquaintances to one of friends. Chisholm is clearly accomplishing his mission of getting people to open up. I can tell it’s taken a lot of courage for A. to talk to me about this part of her life. She wants to tell me more, and I want to listen. I care. But, then, Friends of Emmet takes the stage and we have to stop talking. We are mesmerized by their upbeat, beautiful music and their story. The lead singer, Mark Leddy, talks of the band’s commitment to Collateral Damage’s core mission. They perform one of their new songs, “Coming Apart.” Portions of proceeds of the song are being donated to Collateral Damage. The song is a tribute to Kevin Hines. Hines is one of the few people who have survived jumping off the Golden Gate Bridge in San Francisco. After he jumped, Hines said he immediately regretted his decision to try to end his own life. He is now an advocate for suicide prevention. There’s an intermission; one of the most unusual ones I’ve ever experienced. During this one, everyone is talking and really connecting. The conversations go beyond the superficial level and are intense, in a very good way. There are long lines at Collateral Damage’s t-shirt sales table. The proceeds from the sales benefit the project. People are eager to buy the t-shirts because they want to contribute and feel connected to the project. Meanwhile, those working with Chisholm and Collateral Damage are swamped. They’re like celebrities; everyone seems to want to talk to them. I’m one of those people who want to connect, but then realize they have limited time with the intermission and could probably use a moment to themselves. People continue talking about this amazing, unexpectedly uplifting evening: the talent, the music, the videos, and about their own experiences. Chisholm and others with Collateral Damage have clearly struck a chord which resonates with the crowd. The overall feeling is that we all want to help in some way, and want to stay connected with this project. When intermission ends, it’s a mixed feeling of disappointment (because we want to have more time to talk) and excitement over what’s next: Juno award-winning singer/songwriter Susan Aglukark and a presentation by Nishnawbe Aski Nation (NAN) Deputy Grand Chief Mike Metatawabin. Susan Aglukark shares Metatawabin’s sense of urgency and concerns about the dramatic increase of suicides in Aboriginal communities. She also talks about her own experiences as a survivor of suicide. Aglukark is not only strikingly beautiful inside and out, but also immensely talented. Aglukark is Inuit, and many of her songs’ lyrics tell the stories of the Inuit of Arctic Canada; whom she affectionately refers to as “her people.” Her songs move many of us to tears. Collateral Damages’ special Ottawa program was one of those evenings that you never want to end. It left the audience wanting more: more soulful discussions, more music, and more connections with others. 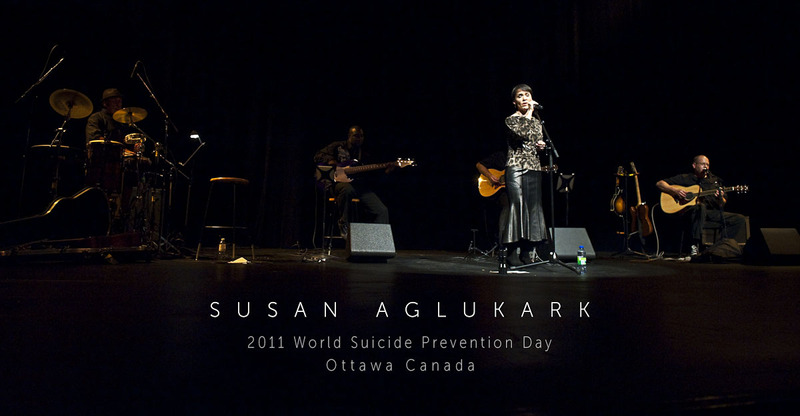 The program also inspired many people to take action in suicide prevention. It was one of the best and most memorable evenings of my life. It was also bittersweet, as I am a survivor of suicide. My own experiences and feelings are much like Chisholm’s, Baumann’s, Metatawabin’s, Aglukark’s, and so many others. I had been feeling a sense of aloneness since my close friend’s suicide in 1996. When I would try to talk to people about John’s death, I realized that most people were uncomfortable and didn’t want to listen. I went through all the stages of grief on my own; his death forever changing my life. However, for the first time I feel I can openly talk and express my thoughts and emotions about John’s life and death. I want to help others. Scott Chisholm has started a conversation about suicide and its aftermath that was long overdue. Through Collateral Damage, he has initiated a universal process of healing, and is changing the world for the better. Scott Chisholm Addresses the audience with Advisors looking on. I am so glad that more people are opening up and healing despite this exteme difficulty of suicide. As more of us dare to step forward, more funding and volunteering will reverse the appalling number of deaths and pain. We can empower each other to transcend our limitations.